The traditional Sunday roast faces becoming a thing of the past as prices are hiked under a new Government tax, a new report showed yesterday. Enjoyed by millions of families across Britain the threat comes amid concerns that people are now too time and money poor to make the quintessentially British meal on a weekly basis. The threat to this national dish was revealed by a YouGov survey as the Government sets to increase the price of hot rotisserie chicken, used by more than one in four (26%) to make a roast, by 20 per cent from Monday. ‘Don’t Tax Our Roast’ – a campaign urging the Government to rethink its plans to add VAT to freshly cooked roast chicken – has already attracted over 30,000 signatures since its launch three weeks ago. The campaign is backed by the British Poultry Council, the National Federation of Meat and Food Traders, parenting website Netmums and Morrisons supermarket – all believe a tax on whole rotisserie chickens is unfair. It says everything you need to know about our mass-produced, pre-packaged supermarket society. 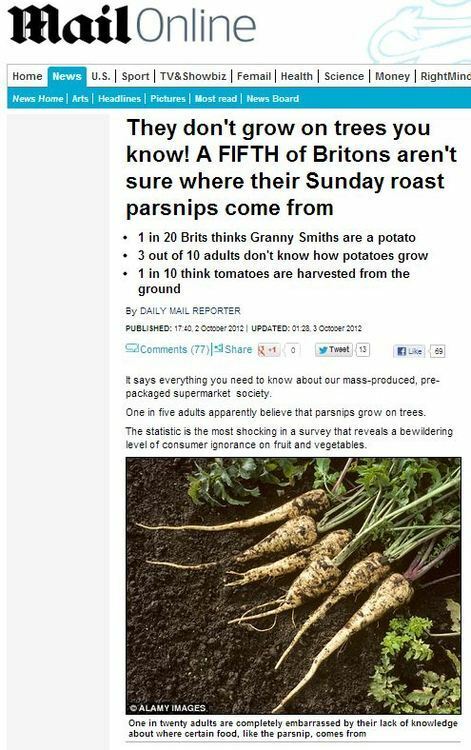 One in five adults apparently believe that parsnips grow on trees. The statistic is the most shocking in a survey that reveals a bewildering level of consumer ignorance on fruit and vegetables. Given that the message we’re told involves adults being ignorant of where vegetables come from, is it any surprise that the source of the story was… the Potato Council? Caroline Evans (from Potato Council) added: ‘Potatoes are one of the most versatile foods – they can be used to create so many tasty dishes and being naturally fat free, they’re a nutritious base for lots of meals too. 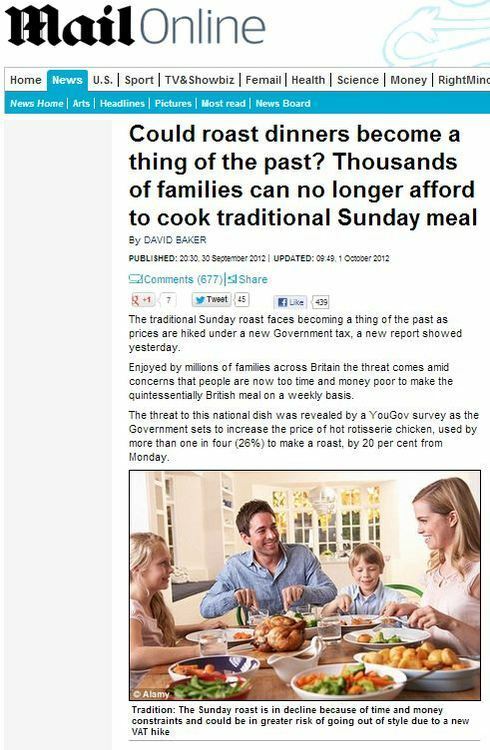 Is the traditional Sunday roast a thing of the past? 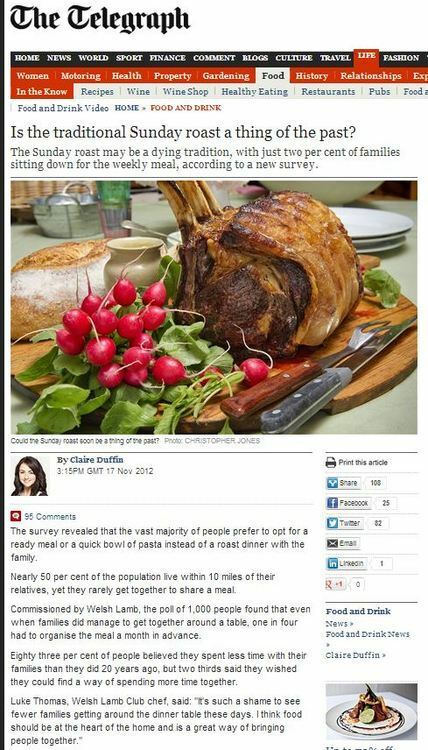 The Sunday roast may be a dying tradition, with just two per cent of families sitting down for the weekly meal, according to a new survey. The survey revealed that the vast majority of people prefer to opt for a ready meal or a quick bowl of pasta instead of a roast dinner with the family. Nearly 50 per cent of the population live within 10 miles of their relatives, yet they rarely get together to share a meal. And who can we thank for this meaty story? With articles placed into the press by special interest groups involved with poultry, lamb and potatoes, we’re only really missing a story from Bisto and we’d have the perfect PR roast dinner on our hands. This entry was posted in Uncategorized and tagged British Poultry Council, Caroline Evans, Claire Duffin, daily mail, david baker, Jamie Winter, Luke Thomas, morrisons, National Federation of Meat and Food Traders, Netmums, Potato Council, Welsh Lamb on January 7, 2013 by Michael Marshall.